Welcome to the first edition of SECA Newsletter. We hope to keep you informed of news and events of importance to folks living in Nanaimo’s South End. Newsletters will be published on a monthly basis, with up-dates and informational postings as needed. 1. Christina Martens from the Canadian Mental Health Association will give us an update on their purchase of the Balmoral Hotel, including the progress and the planned use of the building. Come and get a better understanding of the adjusted plan. 2. Then we’ll “turn the tables” and get YOUR input and ideas on some of the projects that are either underway or planned as part of the South End’s improvement efforts. http://nanaimo.shawtv.com/ then click on the Our Shows tab near the top of the page — then click the Hidden Heroes logo– and select Sydney Robertson from the list of stories. Click on this link to see photos. Thanks to Bill Robinson for featuring the Painting Bee in his Hidden Heroes column in the Harbour City Star…what a great article! Sorry, it’s not on-line, so we can’t provide a link. If you missed the Miners Heritage Photo Display at the Miners Picnic, you can see it at the Labour Day Picnic held 11AM to 3PM at Transfer Beach, Ladysmith on Monday September 1. If you’re feeling the slightest bit handy, the Neighbours of Nob Hill need some help with the assembly of the new playground equipment going into Nob Hill Park on the weekend of September 20 & 21. For further information call Barbara Henoch at 591.2444; she will be happy to provide details around what to bring and exactly when to meet. 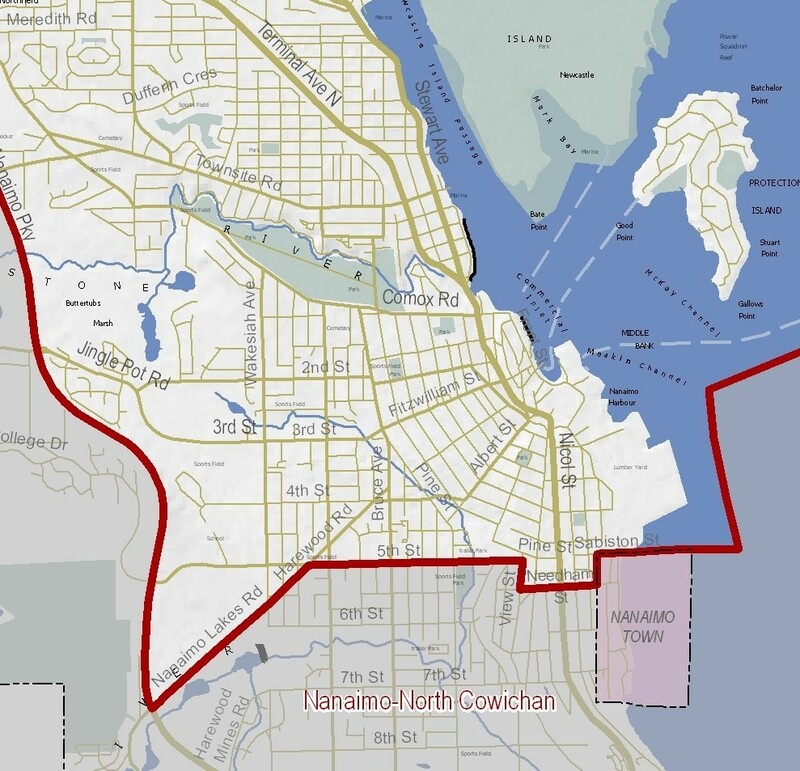 North of this line is the new Nanaimo riding, which is currently represented by Leonard Krog MLA. However, if you live south of this line, you’ll now be in the constituency of Nanaimo Cowichan, currently represented by Doug Routley MLA. First Nations will be included Nanaimo Cowichan. Unfortunately we were not successful in our appeal for all the South End to be included in the Nanaimo Constituency, even though we have more historical connections than the area around Rutherford!! This fall should witness the beginning of an ambitious redevelopment plan for Deverill Square Park, one of Nanaimo’s oldest and best loved parks. The city of Nanaimo will begin upgrading all the play equipment in the park and installing state of the art equipment that will be accessible for both able and disabled children. The Rick Hansen foundation has donated $50,000 to the project and the Gyro Club of Nanaimo have pledged a further $20,000 towards the effort. There are plans for a multi use court for the old basketball site, a walking path around the park, improvements to the curbs and parking, and a redevelopment of the North East boundary that blocks Irwin at Milton. SECA has been talking with various groups including the Chinese Cultural Society, Snuneymeux First Nation and the Labour Council about developing a series of themed gateways into the park that would add aesthetic appeal and honour the rich history of the park and the cultural and industrial influences that shaped the neighbourhood. In the meantime, new floodlights have been installed, youth soccer and the VI raiders are regularly using the park, various neighbourhood gatherings have taken place in the park over the past few months including our 15th annual Miners Heritage Picnic. Watch for an open meeting with Parks and Rec this fall to brainstorm these and other ideas. Deverill Square Park is the gem in our neighbourhood. The best way to keep it safe is to invest in it, show our pride in it, and play in it! For more information, call Douglas Hardie at 754.0677. It’s been almost 6 weeks since we received the good news that the plan to add a Living Room component to the Canadian Mental Health Association’s purchase of the Balmoral Hotel has been scrapped, and replaced with an appointment-only office. There are other components to the social housing plan. We’ve invited Christina Martens from the CMHA to attend our September SECA meeting, to update us on the process, the overall plan, and to answer questions. We’ll keep you updated here. If you can’t make it to the meeting, this link will take you to Derek Spalding’s update in last Friday’s Daily News. Editor’s note: we wish we had the time and manpower to contact people individually, but we don’t, so this newsletter contains meeting notice information. It goes out to about 300 people by hand and e-mail, including Balmoral residents. We’ve just passed the 20 Artbin mark, a pretty good feat for a grassroots project that started with no money less than a year ago….just with the advice from the RCMP that a clean neighbourhood doesn’t attract people who tend to make it dirty. Thanks to the core group of brave souls who stepped up to paint and host bins, and to even fund them…you know who you are! And to the Nanaimo Recycling Exchange, Pacific Prime Painting, and Three Hour Sail for paint donations, and to Home Hardware for the deal on bins. We are really grateful for your support. We’ve got enough learning now to begin placing them in the most-needed places, and are now ready to invite the city and local businesses to get involved. Some of the bins have been produced at Artbin Painting Parties, and some people have preferred to paint on their own. Our next painting event is planned for October. If you’d like to paint an Artbin, or to volunteer to look after one, please call Barbara at 740.0123. We’d like to find someone who can help organize and manage this effort as well. Click on the Our Shows tab near the top of the page — then click the Hidden Heroes logo— and select South End Community Assn from the list of stories.